We look at why exfoliating is an important step to add to your skincare regime and review three exfoliators. Exfoliating the skin removes dead cells which can lead to dull, congested complexions. Regularly clearing dead skin cells makes way for new cells, leaving skin feeling smoother and looking more radiant. In the winter, when skin tends to get dryer, exfoliation becomes even more important. There is however risk of over-exfoliation. Scrubbing the skin too often can irritate the skin and make it more prone to redness and breakouts. Using a gentle formula once a week is recommended. 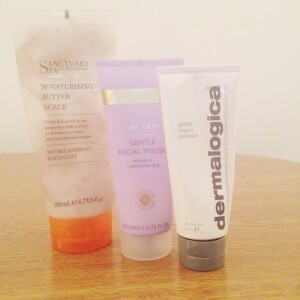 Take a look below for our thoughts on three exfoliators. This mask contains lactic acid and hydroxy acid, which helps dead skin cells to detach, and increases cell renewal. When we tried this we noticed a slight tingly sensation as the mask worked its magic. This leads us to believe that it may be less suitable for those with extremely sensitive skin. After rinsing it off, our skin felt incredibly smooth and rejuvenated. We advise using this once a week before you go to bed. After rinsing off, follow up with a treatment oil or moisturiser before you go to sleep. The new skin cells will soak up the products overnight, leaving you with noticeably softer skin in the morning. There are plenty of ‘grain-y’ facial scrubs out there, but many of these contain coarse grains and can be damaging to the skin. This is why we went for this more gentle formula from Champneys. While it does still contain grains, they are very fine and do not irritate the skin. The polish blends natural sugars, citrus and jojoba beads for a cleansing and nourishing effect. As this formula is so gentle, it can be used more often. We recommend adding this step periodically into your nightly skincare routine when you feel the need for an extra thorough cleansing. Certain areas on the body can get dry and rough over winter, so a scrub that moisturises as well as exfoliates is ideal. We love this moisturising butter scrub from Sanctuary Spa. Blending illipe, coconut and shea butters with natural scrub particles helps to gently buff the skin while hydrating. We found this a great step to add to our morning showers, and skin felt so nourished we even skipped our usual body moisturiser. Find out more about facial and body treatments on our dedicated pages.